There is a popular saying that ‘behind every successful man there is a strong woman’, and actress Mercy Johnson and her hubby are the perfect examples for this quote. 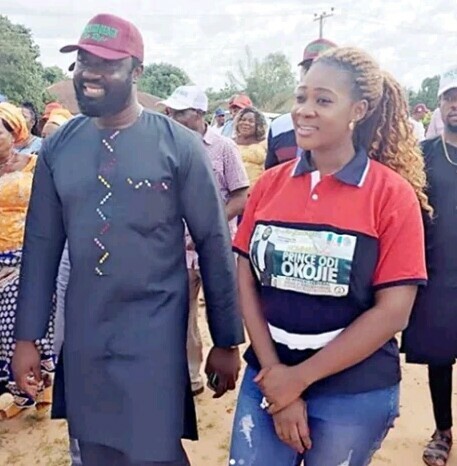 Popular Nollywood actress, Mercy Johnson, has been captured on camera, supporting her husband, Prince Odi Okojie’s political ambition during a recent campaign, as she was seen rocking a campaign t-shirt and face cap as she held her husband’s hand smiling. Prince Odi Okojie took to his Instagram page to share photos from the campaign, and talked about leadership and preserving culture, noting that he decided to stand for the people because he has children and he considers every child his child. Edo State-born politician, Prince Okojie is reportedly constesting for House Of Representatives at the National Assembly.